It's up to Northern Sweden for this team feature as the spotlight falls on Jonas Staflund and his Staflund Racing team. Jonas and the team campaign an Opel Omega funnycar in Super Comp and as well as finding the time to run the car, go to work and spend time with his wife Monica and their two children, Jonas also finds time for his other role, that of president of the SHRA in Skellefteå, the club that organise and run the Gold Town race. Thanks to Jonas for taking the time to complete this feature and supply us with the photos to use in it. Jonas: I´m 33 years old , married to Monica and we have two children , Hampus (7) and Julia (4). I work nightshifts at a gas station and have been since '93 but in February I start working at the local Volvo dealer in customer service. We live in Skellefteå a small town in the northern part of Sweden 820 km from Stockholm. 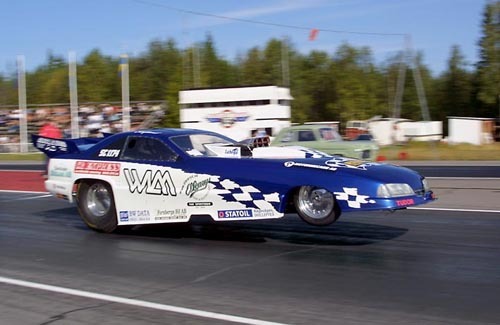 Since '89 I have been the president of the SHRA in Skellefteå, the club that organises and runs the Gold Town Drag race in the middle of the town (the return road runs through a cemetery!!) every year since '93. 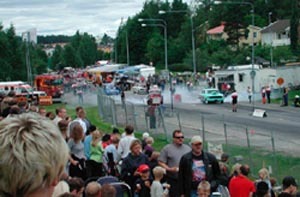 the Gold Town race is one of the races in the Nordic Drag racing series. I used to be a swimmer in my early days but then I started with cars and that is my only hobby these days. Jonas: In August 1987 at Pitea Dragway, in a chopped Austin Mini 1275. I had a best time of 16.42/136 kmh (84.50mph)and I got a prize for making 17 qualifying runs that weekend. The prize was a video about circle track racing! After that I have worked as safety man, announcer, timing crew, marshal and organiser of the Gold Town dragrace in Skelleftea and since 1989 president of the SHRA Skelleftea. 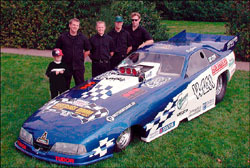 Jonas: Opel Omega '85 Super Comp funnycar. Jonas: In 1997. I got tired of fixing it for race cars to go to schools and different shows and then when it was time the drivers didn't have time or something and I had to fix a new driver and car in the last minute . Now I can promise a race car to show up and I know it will! Jonas: Big Block Chevy, home built. Jonas: 1020 kg (2248 lbs). Jonas: This car is a former Pro Comp (Top Methanol) car but after 10 years in a garage I bought it and put a Chevy BB in it , and now we run it in Super Comp. First we ran it on gasoline but this summer we installed an Enderle injection and ran it on methanol. Jonas: My wife Monica is our crew chief and the one that make sure that we are ready to run at the right time and are clean and not starving. Anders Ingelsson , Arne Westerberg and Johan Wiksten are the mechanics. Jonas: I was invited to be part of the opening of the Gold Road between the village Adak and Kristinneberg , First there was a folkdancing team dancing and after that we did a burnout and a launch. It was a funny feeling siting strapped in the car with 10 dancers and 5 violin players hopping around the car! Jonas: Mantorp 2001 I was taking a walk in the pits when my wife called me on the cell phone and told me that there were two Norwegians drinking beer and taking our fuel system apart! I hurried back to our bus only to find out that It was Anders who had met a Norwegian that could help us with our Enderle so it was no problem , and we went from 9.09 to 8.77 and made it to the quarter final of that race. Jonas: All the nice people and the family spirit around drag racing all over the world. Jonas: My wife Monica who supports me even when I have really crazy ideas like the time when we gathered the Police and the people who decide things in this town and asked them if it was OK to close a street and have a Drag Race there for two days. You should have seen their faces! I also would like to give a medal to all the people who works at the tracks around the world. It's easy to just come to a race make some runs and then go home. Jonas: Westbergs Gummi, Statoil, Olssons Bygg, U- Forsbergs Bil, Tudor, Agrol, BW Data, Lackis, Care, Lahega, Tikurilla, Dinners Restaurants, Skellefte Reklam, Webline Mediagroup, motormecano, Svensk Dragracing and my family and relatives.